From 1944 most Pathfinder Squadrons flew the wooden Mosquito Aircraft, thus were able to fly numerous spoof raids to different Targets to confuse the Night Defences, plus it made the job of the Master Bomber a little safer as the Aircraft did not show up so well on the German Radars. It is said that a German Night Fighter Pilot shooting down a Mosquito, would be credited with 2 ‘Kills’ Which shows how annoying these Aircraft were to the Germans. Undoubtedly, anyone who flew as Crew in a Bomber in WW2 was a brave man. To become a Pathfinder and ultimately a Master Bomber was well above the call of Normal Duty. All of the time over the Target the ‘Master‘ would be continually on the Radio. Therefore not only circling the Target made his Aircraft stand out from the steady Stream, but he was exposed to Radio Interception and could accurately be Tracked by the German Defences, and of course Night Fighters. When WW2 started in September 1939, Bomber Command under the Command of Sir Hugh Portal was in as sorry state. Few medium range Light Bombers and only 1 with true penetration Range – the Vickers Wellington. There was no way that Raids on Germany could be envisaged. A few Daylight Raids were tried on German North Sea Ports, turned out to be a total disaster. The German Luftwaffe were too strong for the lightly defended Bombers. After the claimed ‘Accidental’ Bombing of London in September 1940, it was decided that retaliation Raids would be carried out on German Cities. The Wellington, otherwise known as the ‘Wimpy‘ (After an American cartoon character) was capable of reaching Berlin, but the Bomb Load was far too Light. Various other ‘Heavy’ Bombers became available, such as the ‘Stirling‘ & ‘Halifax‘. These could carry heavier Bomb Loads. There however remained one startling fact. This was Night Navigation. Bombers were being dispatched individually to their Targets, probably at 20min intervals from individual Stations. Most Navigation was dependant on ‘Dead Reckoning’ (DR) or Star Sights. That is not to say the Navigators were no good at their job, it was just an impossible task. The German Night Fighter Defence were soon taking a heavy toll of these individual Aircraft. Plus it was discovered that only 1 in 5 Aircraft were Bombing within 5 miles of their Target. When Portal was replaced by Arthur (Bomber) Harris in February 1942, things began to change with a vengeance. Not only did the System of dispatching individual Aircraft stop completely, but new Bombing Aides such as Gee & Oboe were coming online. Thus was brought into Battle what was to become known as the ‘Bomber Stream‘. This large Stream of Aircraft overcame to some extent the German Night Fighter Defences. No longer could they be homed on to a single Bomber, just put roughly into the Stream and pick out their own Targets. There was still however a major fault. The Bombing was inaccurate and it seemed that nothing could be done about it. In July 1942 a young and very experienced navigator, Wing Commander Donald Bennett approached Harris with a remarkable idea. He would form a Special Squadron of Crews volunteering to return to Flying Duties after their 1st Tour of 30 Missions. These experienced men he would Train intensely to be Target Markers. This was an overnight success. With special Target Markers of varying colours (to stop the Enemy setting false ones), the Main Bomber Stream could see the Target from miles away and supposedly Bomb with Accuracy. Soon however a new problem arose. It was all well and good the Pathfinders marking the Target accurately, but Bombing inevitably started to creep back from the Markers, sometimes to a distance as much as 5-miles. Bennett realised that someone would have to circle the Target and direct the Aircrew where to Bomb. Not the most pleasant of Tasks, but needed none the less. Thus was born the ‘Master of Ceremonies’ – the Master Bomber. The idea was not entirely new. 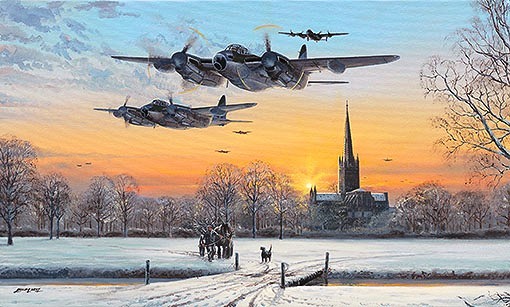 Guy Gibson had done precisely the same Task in the Dams Raid of May 1943. At 1st the Task was carried out by an appointed Pathfinder in the 1st Wave of Target Markers. Flying at 1st a normal Lancaster Bomber, he would assess how accurate the Markers were and then, circling the Target he would talk to the incoming Bombers on Radio, and correct their Bombing. Not a pleasant task, as circling the Target would mean your Aircraft stood out from the Main Stream by this action alone. Master Bomber’s were very thoroughly trained so as not to keep the Main Force waiting. Equipment for Radio Transmission was perfected, a system of giving instructions by Code-words was worked out, and the flexibility of the Striking Force was proven when it passed immediately from attacking Berlin, the largest Target in Germany, to the saturation by Bombing of a single Rail Marshalling Yard. The follow-up Force consisted of several groups, including PFF Aircraft, who marked the Target based on Radio Instructions from what would become known as “the Master Bomber“. The Master Bomber became a common feature of large-scale Raids. In addition to the Master Bomber’s role over the actual Target. He had a few other tasks to carry out on the way. The RAF Bomber Stream on a Raid would very rarely fly a direct route to the intended Target. There would be 1 or even up to 5 ‘Dogleg‘ alterations of course, to keep the Germans guessing as to what the Main Target was. The Master Bomber and his Deputy were responsible for the accurate Navigation of the Stream. At the designated Turning Points he or his Deputy would drop a single sky marker (called by the Germans ‘Christmas Trees‘) He would then assess the accuracy of the Marker & Wind Drift, then transmit the Information to the Stream following up. In the midst of the Stream, would be a few ‘Pathfinder‘ Aircraft (Usually Trainee Crews) who would be responsible for ‘Backing-up’ these markers. Not surprisingly, these Crews were known as ‘Backers-Up’. This routine would be repeated at every Turning Point and approximately 6-10 miles from the Target, the last Ground Marker would be dropped. This was to indicate the Initial Point or the start of the bomb run. Once all this had been successfully achieved, the 1st Pathfinders would begin to drop their Target Indicators. At this point, the Master Bomber would begin to circle the Target and continually advise the incoming Aircraft of the accuracy of the Indicators. The Backers-up, in the middle of the Stream, could reinforce the Target Markers if needed. All of the time over the Target the ‘Master‘ would be continually on the Radio. Therefore not only circling the Target made his Aircraft stand out from the stream, but he was exposed to Radio Interception and could accurately be Tracked by the German Defences, and of course Night Fighters. The Master Bomber would also keep an eye out for Crews who started to Bomb too early. If the Target needed more TI’s then, again it would be down to the Master Bomber to call up the Markers to drop fresh Flares. The Rank of the Master Bomber could be quite low, but he would have a lot of experience, normally a 2nd Tour Aircrew. The role of the Master Bomber was to ensure the ‘Heavies’ dropped their Bombs in the right place. He would be over the Target area for the entire Raid. The Master Bomber would check on the fall of the TI’s. He would then tell the following Bomber Crews where to Bomb in relation to the TI’s. No.5 Group used 627 Sqd, Mosquitoes as Primary Markers. They marked Visually, as against the other Groups who used Electronic Marking such as OBOE (105 & 109 Sqdns.). The idea was to improve Bombing on the PFF laid Markers. Bomber Command had learnt that if the Markers were Mislaid, nothing could stop an entire Raid from failing. Introduction of a Master Bomber gave both the flexibility to change the main area of attack mid-Raid and to encourage Crews to Bomb in the correct place. The Master Bomber and Crew were on the strength of a regular No.8 Group Squadron. In 1943-44, the Pathfinders used modified Lancasters (with special Radios and more powerful Engines). 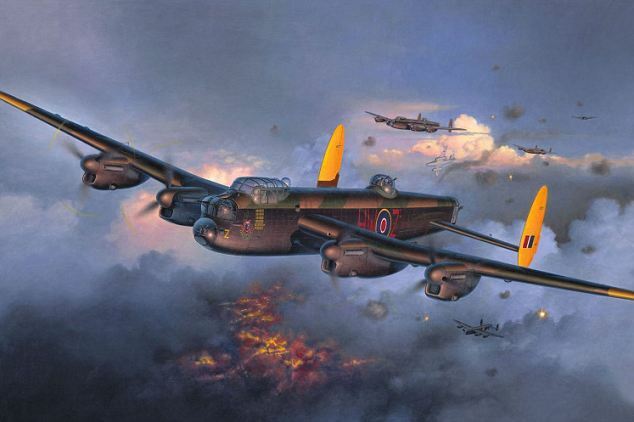 In late 1944-45, Master Bombers used both the Lancaster and Mosquito. It should be remembered that there was also Deputy M/B’s present, as a back up to the Primary M/B. An interesting point is that the Luftwaffe Nachtjagd referred to the Master Bomber as the ‘Master of Ceremonies’. It seems that on many occasions when a night-fighter crew brought down a PFF Aircraft (evidenced by the burning of the multi-coloured flares when shot down) they often thought that they had got the ‘Master of Ceremonies‘. Master Bomber was not an Officially Appointed Rank or Trade (no special ‘Master Bomber’ Badge). Those selected were done so because of their experience & skill. The Master Bomber for No. 5 Group mainly appears to have been selected from within that Group although other PFF Master Bombers may also have been used. Only examination of the Raid reports may shed more light on this. For the most part, in the latter stages of the War, No’s 5 and 3 Groups operated independently of the other Groups. Following a suggestion from No.5 Group, the D/C – in – C wrote to ACAS (Ops) on 14th May 1944, stating that experience with the new Marking Technique carried out by No.5 Group had shown that the success of the Operation depended very largely on the efficiency of the Master Bomber in preparing & executing his Duties. It was essential for him to study most carefully the Tactical Plan for each Operation and to practise and be thoroughly conversant in the detailed Technique of directing the Markers and the Main Force over the Target Area. While hitherto the Master & Deputy Master Bombers had both been drawn from the most experienced Squadron or Flight Commanders, in practice it had been found that the Duties of the Master Bomber constituted a Full-Time job which could not be combined effectively with Squadron & Flight Commander Duties. It was therefore considered to be essential for the Master Bomber to be free from other Administrative & Operational Duties and the D/C-in-C stated that an application would be made to establish 4 Wing Commander Posts as Master Bombers at No.54 Squadron’s Base, Coningsby (No.5 Group). He added that further Posts might be required in other Operational Groups, according to the success and adoption of No.5 Group’s Technique. Establishing the 4 Posts within No.5 Group was agreed subsequently by the Air Ministry.